Bid For $100 Certificates Valid at Lago Ristorante Italiano in Santa Monica, California! 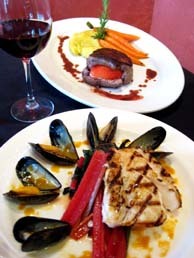 $100 Certificates Valid at Lago Ristorante Italiano in Santa Monica, California! When Lago opened in April 1991, the upscale Italian restaurant quickly established a reputation as having perhaps the only menu in Los Angeles to focus on the cuisine of Bellagio on Lake Como in Northern Italy. Today, celebrating its 18th anniversary, Lago maintains that unique identity and attracts an eclectic crowd of foodies, celebrities, locals and travelers. With its warm, inviting interior, expansive windows and a sidewalk patio overlooking Santa Monica's colorful Third Street Promenade, the restaurant is consistently lauded for imaginative Italian cuisine spotlighting seasonal flavors and the freshest local ingredients. Limited to 1 certificates for 1 - 3 guests per table. Limited to 2 certificates for 4 - 6 guests per table.